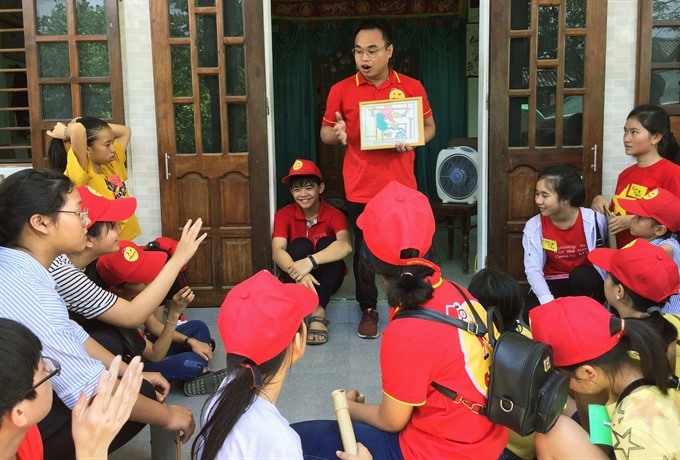 A young single mother has become a language ambassador in the central province of Quảng Trị to help children learn how to speak English in an effort to forget about an unhappy home life and offer something to the community. Nguyễn Thi Hải Oanh, 27, came up with the idea of taking children from her home district of Hải Lăng to meet foreign visitors in Huế to practise their English after she got divorced. “I was in a bad way with debt and the divorce a year ago, and I thought that community work would help pull me out,” said Oanh. “At the time, I was tutoring children for a low salary and I found out they had never had the chance to practise with a native speaker. “I decided this had to change and took advantage of the short distance from my home district to Huế to give the children a chance. In May last year, Oanh embarked on her first trip with children from her neighbourhood. Oanh, carrying her 1-year-old son, led the group from Hải Lăng on motorbikes and electric scooters to Phong Điền District in Thừa Thiên Huế Province, where they caught a bus to Huế. In the former royal capital city, Oanh led the children to the citadel and asked foreigners if they could spend a little time talking to the group. “I am happy looking at the confident boys and girls talking to strangers. 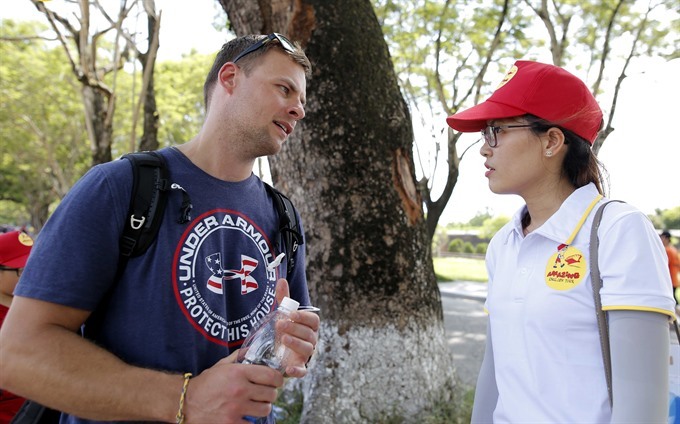 You know many [Vietnamese children] are too shy to talk with foreigners, despite studying English for years,” Oanh said. The first successful trips earned Oanh a good reputation and more children registered to go on trips with her to Huế. Oanh offered free trips to start with, but has now started charging for coach fares and meals. Day after day, more children are signing up for her trips, which she has called "Amazing English Tours". By early July, Oanh had organised 56 tours to Huế and Hội An for almost 1,600 children. 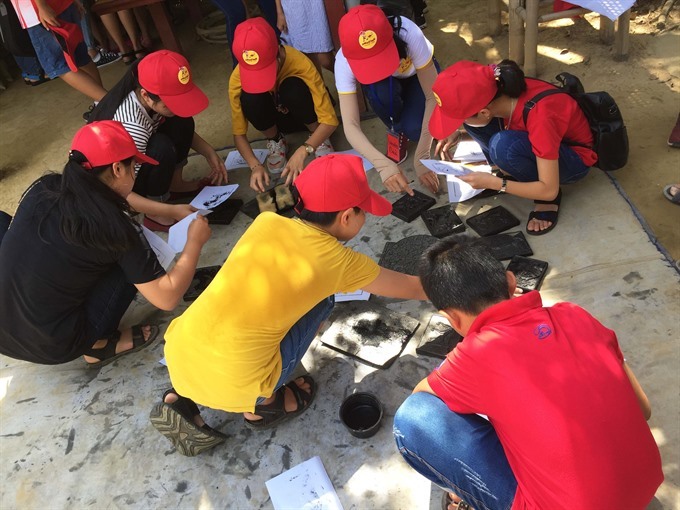 The children, both primary and secondary school students from around Quảng Trị, are divided into groups and play together at various sites, a traditional craft village in Huế and the beach in Hội An. “The tours are very interesting and I have fun with the other kids. But the most special thing is that I had a chance to talk to foreigners,” said Hoàng Bảo Trâm, a Grade 7 student who went on a tour in late May. Trâm said Oanh was a good moderator between the children and tolerant native speakers. “She also took care of us during the trip,” Trâm said. Lê Thị Thanh Nhàn, the owner of a shop that makes paper flowers in Huế, praised Oanh’s efforts, saying the tours looked well organized. “But the most striking factor to me is the way Oanh inspires the children to speak English,” Nhàn said. Nhàn’s place is a regular destination on Oanh’s tours to Huế. According to Oanh, she had no experience as a tour operator but the skills she used working for three years as a television programme editor in HCM City have helped her. Oanh now runs three tours a week for around 30 children each. She has volunteers with her to work as team leaders, usually high-school students or graduates with good English skills. Nguyễn Trí Cường, a volunteer, said he was convinced of the positive impact it was having on the local community, so he wanted to lend a hand during his free time. Oanh has bigger plans. She wants to build a facility in her home district and invite native speakers to come and communicate with the children. At the same time, she is preparing to launch overseas trips to other Southeast Asian countries.